Art Projects International is pleased to announce that the Cincinnati Art Museum recently acquired Untitled (Poetry #98-1), an important early poetry painting by Pouran Jinchi, for the museum’s permanent collection. Untitled (Poetry #98-1) is an excellent example of Jinchi’s early poetry paintings that incorporate abstract calligraphic marks against backgrounds of even hue and contain subtly etched inscriptions. Jinchi’s early poetry paintings (created from 1996 to 1999) represent her breakthrough works and were first exhibited in Pouran Jinchi: Recent Paintings at Art Projects International, New York in 2000. 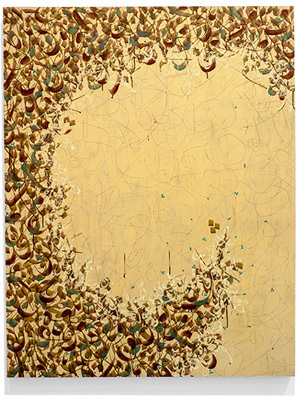 This work, Untitled (Poetry #98-1), was part of her critically acclaimed in-depth survey of paintings entitled Pouran Jinchi: A Survey (2008) at Art Projects International, as well as in an exhibition at The Vilcek Foundation in 2008.